February 14, 2018, 11:49 AM · This year's Sphinx Competition winner Rubén Rengel, 22, grew up in a home filled with music - Venezuelan music, that is. "I started kind of young, because my dad is a musician also; he plays Venezuelan traditional music, folk music and popular music," said Rengel, speaking with me over the phone from his practice room at Rice University's Shepherd School of Music in Houston, where he is in his second year of a Master's program, studying with Paul Kantor. Born in the summer on Margarita Island, Rengel grew up in Venezuela's capital city, Caracas. His father, Jesús "Chuíto" Rengel, plays mandolin, guitar, Venezuelan cuatro, bass -- plucked instruments, Rengel said. "I also grew up playing that kind of music, and I love it to death. My sister (Brenda Rengel) also plays violin, and my mom (Sara Cardona) sings a little bit for fun." The family would often play together at home, switching between melodic and accompaniment instruments. Rengel would play a few chords at the piano, or play cuatro or violin. "Venezuelan music is so varied by regions in the country; there are so many genres, so many ways of playing it," Rengel said. "Because my family is from the eastern part of Venezuela, I mostly played those genres, for example, the joropo. It's a very lively, 3/4 feel. It developed from the European waltz, except about three times faster! There's a lot of flourish and improvisation, with flashy stuff going on, and so much flavor to the music. Of course, there also is sensitive and more reflective music, like Venezuelan waltzes, which also come from the European waltz, but they are actually much slower. I guess we are people of taking things to extremes! And there is also a well-known genre in 5/8, so it's pretty not-stable, pretty fun, called the Venezuelan merengue." "So I learned how to improvise in a whole different language, a whole different genre," Rengel said. "I developed that along with classical music, which is I also absolutely love." 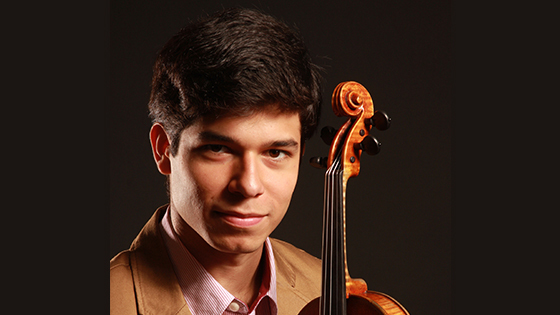 Rengel started violin at age three in Venezuela's national system of music education, El Sistema. "I was there only for a short time, though," said Rengel. "I don't consider myself part of El Sistema. I was there until I was six, which was when I went to the Emil Friedman Conservatory and School, and I was there from first grade until I graduated. That's where I studied with Iván Pérez (Núñez), my teacher for 11 years, the one who taught me everything!" Rengel doesn't remember a lot about El Sistema, but he does remember that that's where he learned the basics, and "I do remember that I had wonderful teachers, even when I was young." he said, naming teachers Josbel Puche and Maria Carolina Bermúdez. After El Sistema he went on scholarship to Friedman, a private school in Caracas. "I think about Ivan as my second dad, pretty much," Rengel said. "Of course, he was an amazing violinist, an amazing soloist. And he was completely dedicated to teaching; he had so much energy, so much passion for teaching. He's such a special guy. I would come in for lessons for a half-hour every day, for years and years. That kind of dedication is amazing. I thank him for believing in me, and for trusting in me, to give me so much of his energy and his knowledge." While at the Friedman School, Rengel served as concertmaster of the Arcos Juveniles de Caracas, the Filarmonía Caracas, the Orquesta Haydn, and the Orquesta Típica. Right after Rengel graduated from Friedman, he came to the United States, while his family remained in Venezuela, where they still reside. He was 16 years old at the time, and he has been in the U.S. ever since, with only the rare trip home. It all happened very quickly. "I had the chance to play with the Venezuela Symphony Orchestra as a soloist," said Rengel, who performed the Tchaikovsky Concerto as his debut with the orchestra, after winning a competition at the Friedman School. That is when he met conductor Theodore Kuchar. "He asked me what I was doing after I graduated, and I had absolutely no plans," Rengel said. "I was just planning on staying another year with my teacher, then audition in other places. Of course, doing higher education in music in Venezuela is not easy. You can't really find a school like the Cleveland Institute." In fact, the Cleveland Institute is exactly where Kuchar pointed him, offering his highest recommendation and guiding him through the process. Two months later, Rengel was at Cleveland, studying with Jaime Laredo. "I loved the school," Rengel said. "It was such a great opportunity, I got to study with Jaime Laredo, one of my absolute idols -- a legend of the violin. It was so special to be at that school." After four years, Rubén graduated and then went for graduate studies with Paul Kantor at Rice University's Shepherd School, where he plans to stay next year as well. Rengel is looking forward to the opportunities that come with winning the Sphinx Competition - performing with orchestra as well as other activities. "You can be involved with them in many, many ways," Rengel said. "They're diverse in what they do, and it seems like a perfect way to start that part of my career." Rengel actually played his first Sphinx Competition in 2016, when he came in fourth in the Senior Division. He also won a bronze metal in the 2015 Fischoff Chamber Music Competition with his chamber group, the Autana Trio, which is on hold for now while one of its members studies in Korea. He has also won other competitions - the CIM Concerto Competition in 2014; and the Juan Bautista Plaza National Violin Competition of Venezuela in 2011. "You can see it as scary, but you can also see it from another perspective completely," Rengel said. "For any audition, any competition, any time you play for anyone or in a competitive situation -- I tend to think non-judgmentally. Of course, I prepare critically and passionately, but I don't focus on the competitive side of it. I just want to share what I've done so far, share what has inspired me, and share what it means to me." BELOW: A short interview with Rubén Rengel, followed (at 1:00) by his performance in the 2018 Sphinx Finals of Violin Concerto No. 3, mvt I, by Saint-Saens, with the Sphinx Symphony at Detroit's Symphony Hall.